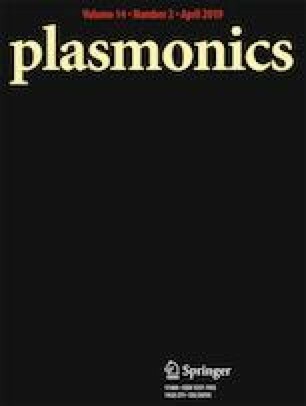 In this article, a surface plasmon resonance (SPR) biosensor based on D-typed optical fiber coated by Al2O3/Ag/Al2O3 film is investigated numerically. Resonance in near infrared with an optimized architecture is achieved. Refractive index sensitivity of 6558 nm/RIU (refractive index unit) and detection limit of 1.5 × 10−6 RIU, corresponding to 0.4357 nm/μM and detection limit of 23 nM in BSA (bovine serum albumin) concentration sensing, are obtained. The analysis of the performance of the sensor in gaseous sensing indicates that this proposed SPR sensor is much suitable for label-free biosensing in aqueous media. This work is supported by the Innovation Foundation for Doctor Dissertation of Northwestern Polytechnical University (Grant No.CX201818). 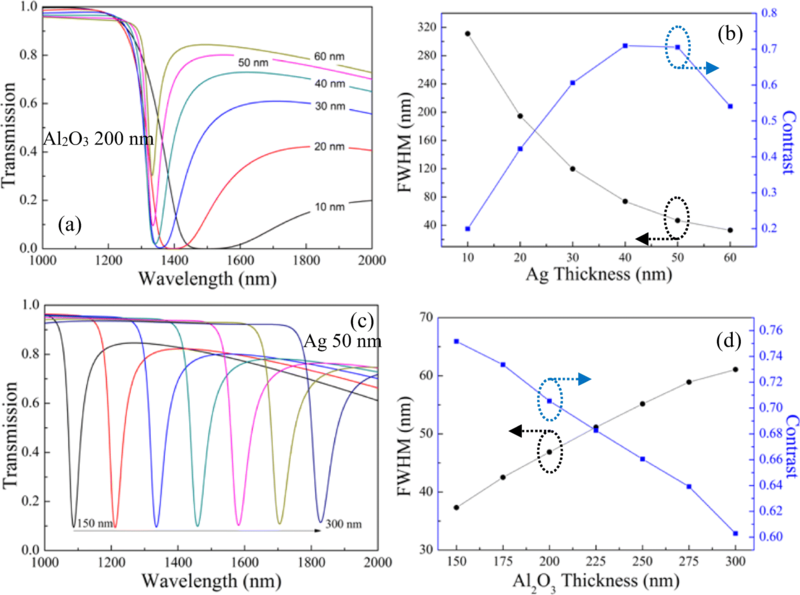 The thicknesses of silver layer and Al2O3 layer are set to be 50 and 200 nm, respectively. The surrounding sensing medium is air, whose RI is 1.0003. Based on the FWHM and contrasts as shown in Fig. 5, we choose 11.2 μm as the optimized height, i.e., the residual thickness of the fiber cladding is 3 μm. For the optimization of the silver thickness, the Al2O3 layer is set to 200 nm and the sensing medium is air. 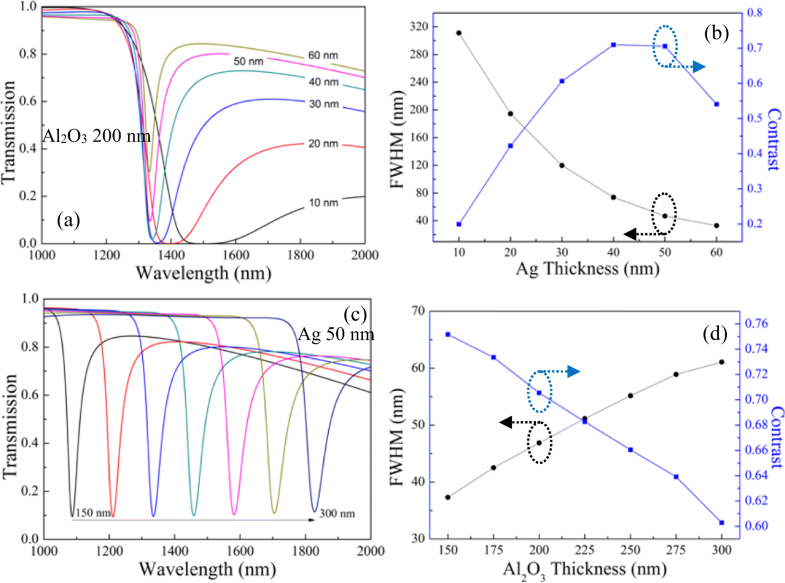 Fifty nanometers is chosen as the optimized thickness for silver layer as shown in Fig. 6a, b. Considering the cutoff wavelength of SMF-28 fiber is 1260 nm, we choose 200 nm as the optimized thickness of Al2O3 layer as shown in Fig. 6c, d.
For sensing in gaseous media, the resonance spectra and sensitivity in respect to ns, varying from 1.0001 to 1.001 with a step of 0.0001 are plotted in Fig. 7. A sensitivity of 872.73 nm/RIU with a correlation parameter of 0.9999 is obtained, which is almost one order of magnitude smaller than that in aqueous sensing. This indicates that the proposed SPR sensor is more suitable for aqueous sensing and much potential for biosensing.